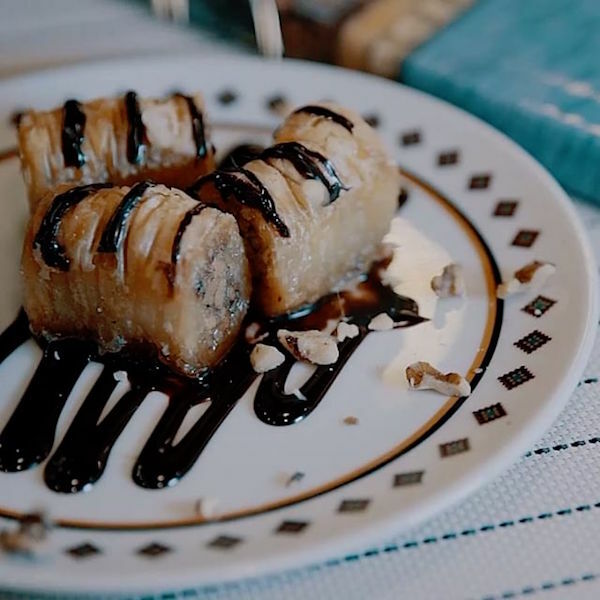 For a fast lunch in midtown, a box of pastries you can take to the office, or a delightful Mediterranean dinner, check out Fournos Theophilos. Opened in October 2018, this casual Greek cafe serves delicious baked goods and savory entrees from its two-story location near Times Square. Chefs Dionisis Liakopoulos and Yannis Tsiakos, both from Greece, carefully recreate dishes from home like lentil soup, spanakopita, and roast beef with orzo, all with an affordable price tag. There are new innovations as well like the lunch bowls and a baklava milkshake. Read on for some highlights from Fournos, now open on West 45th Street. Fournos was founded on a love of Greek culture. This includes not only Mediterranean foodways but historical art and artisanship. 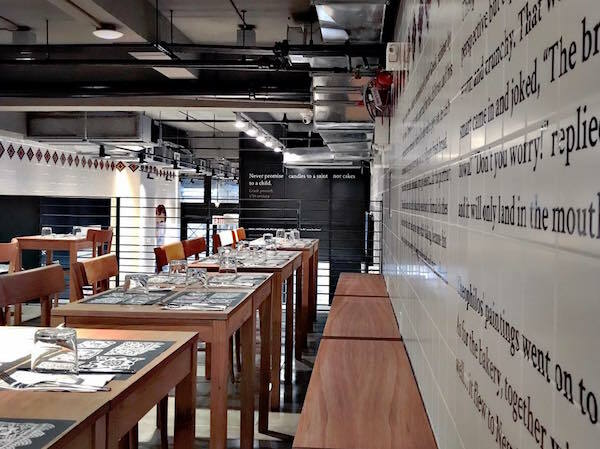 The interior of Fournos is filled with text from Greek literature painted on the walls (and selected by author Christos Chomenidis), postcards printed with works of Greek craft, and take-away sacks bearing the image of a woven bag. The restaurant’s namesake is Theophilos Hatzimihail (c.1870-1934), a Greek folk painter who once painted a portrait of a baker and accepted his subject’s bread as payment. A mural resembling Theophilos’ baker painting appears on the second level of Fournos. While inside, you’ll be inspired by the friendly demeanor of your servers, all welcoming you into this authentic Greek kitchen. Start your day with a breakfast of Greek coffee and one of Fournos’ many pastries. There’s the flaky bougatsa with vanilla custard, cinnamon, and powdered sugar, or classic baklava. There are also croissants, sweet breads, and muffins on offer. Dine-in breakfast options include a scrambled egg sandwich and sweet tsouneki toast with banana, chocolate, and peanut butter. Fournos also makes its own Greek yogurt if you’re looking for a delicious dose of protein to get you started. And if you need a midday pick-me-up, the pastries and coffee are available all day long at the counter. For lunch, have a bowl, which you’ll watch a Fournos staffer construct as you move down the counter (and the scents from the kitchen will make you even hungrier!). Start with a base of lentils or orzo, then choose other toppings and proteins like lamb stew for a hearty meal. Salads include a bean salad with smoked salmon, while you can’t go wrong with the Naxos sandwich with Naxos Graviera cheese, ham, tomato, and mayo. The sandwiches and peynirli—or cheesy Greek flatbreads—are available all day in case you need a late lunch or early dinner. Dine-in is available on the second story of Fournos, or you can carry out for a picnic at nearby Bryant Park. Offering an expanded dinner menu, Fournos should be your go-to for Greek spreads and hearty, home-cooked entrees. (There's table service in the upstairs dining space.) Have a spicy feta or fava on warm pita, followed by roasted leg of lamb braised in tomato lime sauce, along with chickpeas and yogurt lemon sauce. Try the Greek-n-Cheese, made with graviera, manouri, and feta cheeses and topped with Cretan sourdough crumbs. Whatever you do, be sure to have a dessert of deconstructed baklava, orange pie, or another of Fournos’ many house-baked goods. Order Greek coffee, and you’ll get a free sweet bread to go with it. 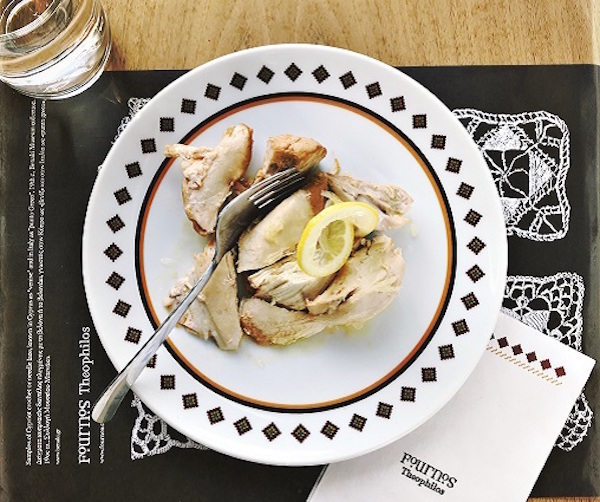 On weekends, head to Fournos for some of their best dishes at brunchtime. There’s the Green Salad with Manouri cheese, Greek-n-Cheese, and burger with feta. Go sweet with a pastry or banana hazelnut toast. Although the Greek coffee is the best caffeinated beverage here, there are also espresso drinks, drip coffee, and tea. Fournos Theophilos is located at 45 W. 45th St. Call 212-278-0015 or visit fournos.com for more.